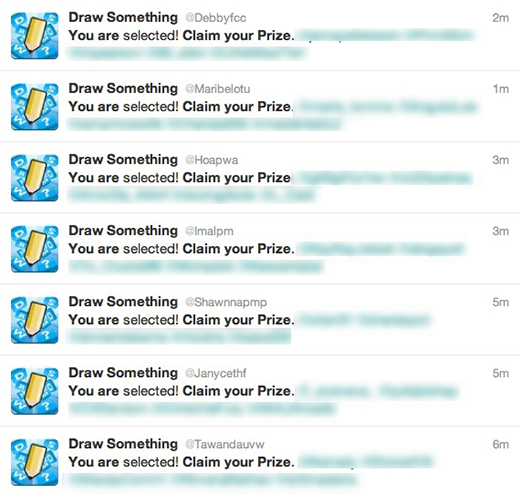 Spammers have been capitalizing on Draw Something’s popularity, targeting unsuspecting users on Twitter, Sophos reports. Prior to its multi-million acquisition by Zynga, Draw Something had netted over 30 million downloads. The app held the top spot for both free and paid apps in the iTunes app store, that is until Angry Birds Space came along, but has still snagged millions of downloads on both the iOS and Android platforms. Taking advantage of the app’s success, Twitter accounts have been created targeting users who have tweeted about the game in the past. Sophos points to a Twitter account telling users they’ve been selected for a prize. Interestingly enough, basic grammar isn’t the only thing missing from the tweets – with no link for spammed users to click. Going to the Twitter account’s profile, however, the website drawsmethingwinner.com is included in the bio, and encourages visitors to answer a few questions about the app to walk away with a free gift worth $500. The survey consists of three questions – are you male or female, how often do you play Draw Something, and what’s your opinion on the game, after which you’re presented with a link to ‘Claim your prize’. A search on Twitter for the phrase, “You are selected. Claim your prize” reveals that @Tawandauvw is far from the only account spamming Draw Something fans on the social network, with almost 30 active accounts tweeting in the last half hour alone. Twitter’s lack of an effective spam control system makes these kinds of scams all too easy to put into play, and sadly they are all too common. We’ve seen scams target users via direct messages, via apps that claim to show you who’s visited your Twitter profile, and now now we can add Draw Something’s popularity to the long list of scams that Twitter has witnessed.